John-William Greenbaum has learned the power of TTM autographs. Instead of a signed index card, he’s getting unimaginable first-hand observations of the minor league legend that was Steve Dalkowski. John-William shared his hobby background, and tips on how he’s reaching the forgotten men. Q: How long have you collected autographs? How much has been in-person, versus through the mail? A: I actually came into autograph collecting fairly late, considering I’ve collected cards since 1997. My father really introduced me to autographs when he brought out his collection, which consisted of a signed Sandy Koufax postcard he had signed in 1958 and a New York Mets cap that he had Ron Swoboda sign ten years later. I never really knew about TTM until I started going onto various baseball forums. As such, most of my autographs since, oh, about 1999 were purchased certified or gotten in-person at card shows. The first autograph I got for myself was actually my mother’s 13th birthday gift to me, which was a 1966 Topps baseball card autographed by Willie Mays. Willie Mays was and is my father’s favorite player since Dad grew up as a New York Giants fan, despite being from the Bronx. His father, you see, had moved there from Manhattan. The first autograph I got at a show, though, was Willie Randolph in 2002. I’ve since heard some collectors say “oh, that must really have been tough, since Willie Randolph doesn’t like signing autographs.” That was not my experience and as a matter of fact, I found Mr. Randolph to be a very nice guy to both myself and to Dad, who took me there. My first TTM autograph was a Mets relief pitcher, a right-hander named Juan Padilla. He’d pitched really well for the 2005 Mets and I wound up getting him TTM in 2007. Unfortunately, he’d had all kinds of arm problems. At that time, I mostly bought certified autographs off eBay, but I couldn’t find one of Juan Padilla. So I sent to him and, because my neighbor at the time was a big Minnesota Twins fan, I also wound up sending two cards to Pat Neshek, who signed both of them. One for me, one for my neighbor. My first retired TTM autographs came after I got Harvey Meiselmann’s 2008 address list. I realized pretty quickly that those Minor Leaguers who had cups of coffee in the Majors who faced Steve Dalkowski would be listed in there. The very first person to respond to me, however, was far from a guy who just had a cup of coffee: it was my good pal Al Ferrara, who batted against Steve in 1960, when Mr. Ferrara was with the Reno Silver Sox and Steve was with the Stockton Ports, both of the Class C California League. He signed his 1971 Topps card for me. Q: What’s your hobby focus (outside of the Steve D book) today? A: Definitely the players who played with or against Steve Dalkowski during his career, Major League and Minor League. There are some other ballplayers I’ve tried to collect that were in the Orioles organization at that time, as well, even if they only knew Steve from Spring Training. The more connection to Steve, the more interested I am in having a given player’s autograph. Take Bill “Leroy” Massey, who caught Steve’s first ever game. That’s one of my favorites, as is, of course, the info Bill supplied to me. I’m now looking for George Pena, who caught Steve’s last ever regular season game (Mark Schultz was his last catcher in Spring Training, 1966, and I do have his autograph as well as great info from him). A: It’s actually fairly easy. It doesn’t always work, but I have a success rate of over 50%. You see, what I do is go to baseball-reference.com and look at the box scores I have and look up that opposing player. Virtually always, you’ll get a full first name, middle initial, and of course last name as well as a year of birth. Next stop is the Social Security Death Index. It’s morbid, sure, but you have to remember that some of the ballplayers Steve faced batted against him over fifty years ago. Then you go to both www.whitepages.com and www.zabasearch.com. Enter the name with the middle initial and look for an age estimate. If a guy has a very common name, it starts to get hard, but the less common the name, the better your chances of finding him are. I should note again it doesn’t always work. The two best pitchers who opposed Steve in the 1960 California League were Gary Kroll, who Harvey Meiselmann has listed in his address book, and Bob Arrighi, who had a truly amazing year and was named the California League MVP: 16-10, 155 IP, 230 K’s, 69 games pitched, every one of them in relief, and oh yes, he came in second for the Cal League’s ERA title with a 2.61 ERA. Well, Bob Arrighi took me FOUR YEARS to find! You see, whitepages.com mistakenly listed his age as his wife’s age and his middle initial as the first letter in his wife’s first name. There’s nothing you can do when something like that happens. I got lucky…I found Bob and consider him a very good friend…but with other guys like Bill Rozich, Manley Johnston, Tom Murray, Joe Pulliam, George Pena, and Pete Olsen, I know they’re alive, but have never been able to find them, likely because of that same reason. If you played with or against Steve Dalkowski and you’re reading this, please send Tom an email. I’d like to speak with you. Q: You’ve gotten their autographs, along with questions answered? What do you have them sign? A: If I find a photo, then a photo. If I can’t find a photo, then a Signature Card with the picture of a baseball’s sweet spot on it. I also have some Rackrs cards that someone gave me, which are the same principle. A: I’m getting their autograph for two reasons: first, because I collect the autograph of anyone who ever played with or against Steve Dalkowski. In that way, they all witnessed history; I believe Steve to have been the fastest pitcher with a significant professional career. But secondly, today, we see many Minor Leaguers given baseball cards that never play in the Major Leagues. Tons of coverage. Blogs, newsletters, and scouting reports on the internet devoted to them. And we follow them. To me, what I do is prospecting fifty years back in addition to getting the signature of someone who interacted with Steve Dalkowski. Let me give you a totally random example: Bill Kalmes. Bill Kalmes was a left-handed pitcher with very minimal interaction with Steve. He was put on the same Winter League roster as a paper move, but that was it. A paper move. I didn’t know it at the time, but Bill confirmed it for me. But then there’s the tantalizing story of Bill Kalmes himself. Ask anyone in the Dodgers organization in the early 1960’s and they’ll know the name. He threw almost as hard as Sandy Koufax…he was certainly the second-hardest-throwing lefty in the organization. But Bill had what I believe to be a sort of a mental block: unless he was pitched in a regular rotation, his mechanics would fall apart. The result was two wasted years, then suddenly finding himself, tearing up the Alabama-Florida League for one season, there was talk of promoting him all the way to AAA ball and the Majors were in sight…and then he pinched a nerve in his elbow. And this wasn’t Bill. This was everyone that remembered Bill. Then there’s Arne Thorsland of Baltimore. He’s one of the smartest guys I’ve ever spoken with and by the time he was Steve’s teammate, his “fastball” was going on brains alone. Arne wasn’t always like that, though. When he was signed in 1959, everyone who was his teammate put him at the top in terms of right-handers’ velocity and, more importantly, he threw the most vicious slider anyone had seen. But Paul Richards was an early advocate of changing pitchers’ deliveries. He wasn’t malicious about it, of course. 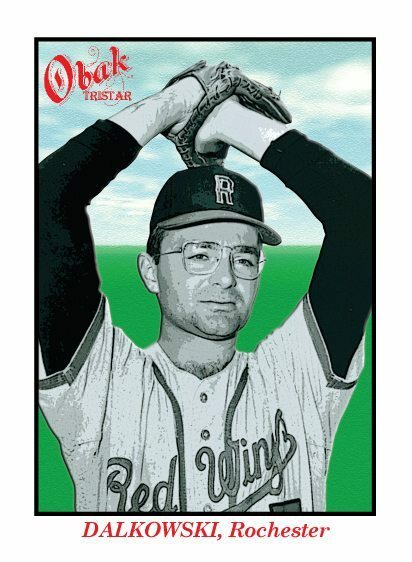 He just believed that Milt Pappas’ mechanics were essentially perfect and that all of the other Baltimore pitchers, with an exception here and there, needed to copy Milt Pappas. He was trying to stop injuries, not cause them. It was very noble, yet also a bit too radical. Arne Thorsland threw from a low three-quarter arm angle, which was highly atypical of a pitcher of his size (6’4″, 220 lbs). Control problems and shin splints followed, and when Arne changed his delivery to avoid the shin splints, then you had arm problems. Still, he was so highly regarded as a prospect that the Los Angeles Angels wanted to take him over Dean Chance. Bert Barth was perhaps one of the first victims of “prospect hype”. Signed by Baltimore in 1957, he was literally compared to Babe Ruth. Yes, Babe Ruth. Could he hit? Yes, and from everyone’s recollections, he could do so at a Major League level. Could he pitch? Yes, but not well enough to make it on a Major League level. Bert threw a high 90’s fastball that was flat as a pancake and a slider that just kinda spun. But nobody could really agree if he was a pitcher, a first baseman, a third baseman, or an outfielder. It started to get to him and the pitching interfered with his hitting mechanics. Finally released, he began to tear up the Carolina League when he no longer had to pitch. But baseball was no longer fun for Bert. All that shifting around had turned it into one big chore. He retired at the age of 25, almost a lock to make the Major Leagues. Ray Youngdahl, Wilbur Huckle, Ike Futch, and Mike Sinnerud were all on track to make the Major Leagues, but freak injuries derailed them. With the exception of Ray, the latter three were literally on Major League rosters. Others, like Ron Kotick, were born before their times. Inheriting Steve Dalkowski’s old nickname of “White Lightning”, Ron threw really hard. But as one Mets organizational player told me, “we used to call him Four-Inning Kotick. He was lights out for the first four innings, then lit up for the next four.” Ron’s speed be darned; he had almost no endurance. He had a heck of a fastball and a slider, though. He’s the type of guy who’d have millions in the bank as a door-slamming closer these days. Bob Arrighi was MLB-caliber…nobody disputes that. Heck, Leo Durocher thought he would make it. But he also suffered a torn ligament after an alteration made to his delivery in 1961. Even the most pessimistic people I spoke with said Bob was a Major League caliber pitcher at least and a Major League relief ace at most. With the Minor Leaguers, you look at their records, but for me, as opposed to wondering “what might have been?”, I see the record, I know the league factors, and I know what was. These guys did remarkable things in many cases. We may not remember Art Henriksen or Jim Little or Joe Messina, but these guys flat-out dominated prior to injuries. Then you had guys like Fred Hopke or Conrad Munatones on the hitting side where Sabermetrics proves they were darn good players given where they played, especially. And of course, this was before expansion in many cases and in all cases before the 1969 expansion that briefly, in my opinion, diluted the talent pool because you really didn’t yet have the pipelines of talent that were the Dominican Republic that finally started to show some results during the late 1970’s and early 1980’s. Q: Likewise, I’ve thought: minor leaguers don’t want to sign autographs. Many would be bitter they didn’t get a shot at the majors. They want to forget that part of their lives. Can you site an example two of former minor leaguers simply happy to be remembered? A: Quite the contrary. Many are very happy to be remembered. Although a great many are bitter (and in some cases, extremely bitter), they’re nice people who are more happy to be remembered than they are bitter in most cases. I’ve only had three people turn me down for signing: one is paralyzed from the neck down, one is paranoid (and that ultimately got him released, I later found out), and one just quirkily refuses all autograph requests. He’s a really nice guy, he just will not sign. But everyone else? They like it when you can recite their stats, ask ’em about who they played for, and things like that. I personally think it’s awesome. Happy to be remembered? I’d say everyone. There is one guy I know who only signs because he actually did have his ID stolen, but that’s a pretty rare case, to be honest. Bob Beattie told me he wished he signed more autographs. Same with Tom Klukososki (who legally changed his name to Tom Kaylen). Q: Getting Steve’s book done is a goal. What are your autograph collecting goals? A: To get everyone who played with or against Steve Dalkowski. Is that gonna be hard? Oh yeah. But is it something to try for? Yes, that too. After that, probably to get everyone who ever played for the New York Mets. Dad was and is a very smart baseball fan. He knew there was a National League team coming in when the Giants and Dodgers had left, or at least thought there would be. And he was right. Dad was a fan from Day One. And of course, he passed that fandom along to me. Without the New York Mets, I would not be a baseball fan, so I think Mets and Mets organization autographs, too, are high on my list. Coming Wednesday: Did Steve Dalkowski really inspire the movie Bull Durham?